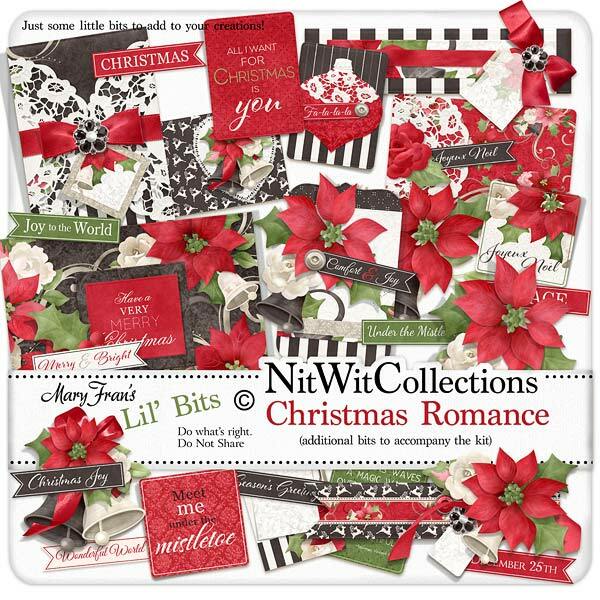 Lil' Bits "Christmas Romance" is a "Must Have" digital elements pack when you feast your eyes on all that it has to offer!! Toppers and journal cards that are so intricately designed that they could be stand alone Christmas cards, and flower clusters and bells that will make your heart sing with creative ideas! Don't miss out on these digital elements as they are not included in the FQB "Christmas Romance" Collection so please don't miss out on owning and creating with these elements! 1 Bells all tied together with a beautiful red bow and poinsettia. What carol is this set of bells ringing out in your scrapbook layouts, cards, and mini albums?? 1 Flower cluster that shows off its beauty in so many ways! 1 Journal card - "All I want for Christmas...."
1 Journal card - "Joyeux Noel" created in the simple and elegant white of this kit to let the Christmas flowers steal the show! 1 Journal card - "Meet me...."
1 Journal card - adorned with the reindeer and the bell cluster...use it to dress up your mini albums, cards and scrapbook layouts...you'll be glad you did! 1 Journal card - "Fa-la-la-la"
1 Journal card - "Christmas waves a magic wand...."
1 Sentiment card created in the rich florals with a bold black background to wish someone you love a "Very Merry Christmas"
1 Topper wishing your recipient "Comfort and Joy"